MORGANTON, North Carolina -- A teen who is his high school's No. 1 basketball fan got to get out of the stands and onto the court Tuesday night. 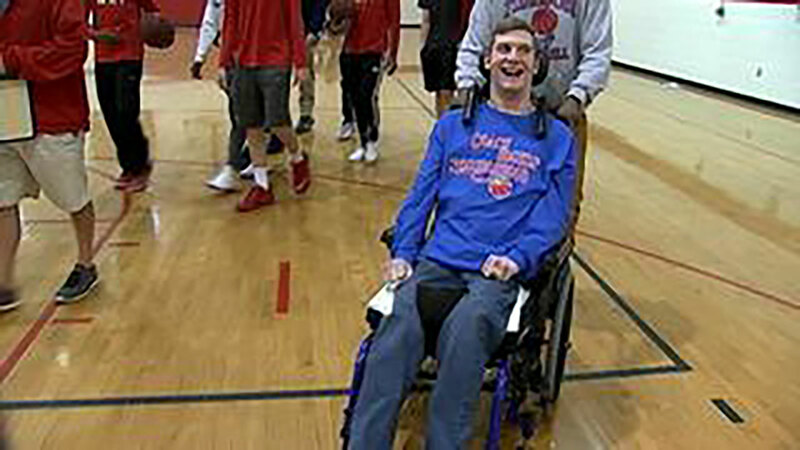 Mitchell Greathouse attends every sporting event at Freedom High School in Morganton to cheer on the teams, but on that special night he got to put on a jersey and play alongside the basketball team. Mitchell has spastic quadriplegic cerebral palsy and trained hard to get into the game. He accepted a challenge to be in the game from the basketball coach. The challenge was that if he achieved a 50-step goal in his gait trainer, he could suit up for the game. The next day, Mitchell accomplished that goal. The entire community came together to make Mitchell's dream come true. "The sweetest, most social young man that you'll meet," Mitchell's grandmother Gigi DeHart said. "He has a smile that's infectious." Mitchell's first play was executed perfectly, an assist putting 2 points on the board. He got many cheers, even from Freedom High's rival team, Patton High School. Coach Casey Rogers said this moment was much bigger than the game, it was one young man's living example to his peers of triumph over adversity. "They learn about how someone's spirit and strength, and courage can affect so many people around them," Rogers said.